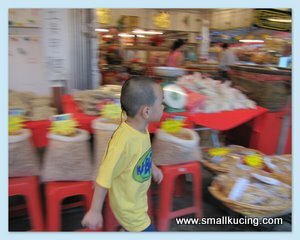 SMALL KUCING: Quest for the Balls and Dinner at Restaurant Ban Joo Hing, Tanjung Sepat. 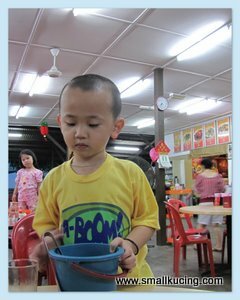 Quest for the Balls and Dinner at Restaurant Ban Joo Hing, Tanjung Sepat. Wah...playing by the sea very tiring and thirsty leh. Lucky Mamarazzi pandai(clever). She took along some ice cold 100 plus in the Cooler bag. Where are we going next ah? Food hunting ah? Me hungry too. Good idea wor, Papa. Ya, let's go Tanjung Sepat to have dinner. Wanna hunt for some balls too...fish balls. Is it here? Nah...it's only dried shrimps...naughty Papa push my head on the plastic of shrimps when I went and sniff sniff there. Phew! 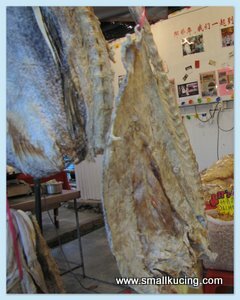 Ikan Masin(salted fish). Auntie Litte Bird...one of these days you must certainly come here...can play by the beach and borong salted fish. Can't find the balls anywhere. Since both Restaurant Ocen and Restaurant Lovers Bridge are full of people, we decided to have our dinner at a nearby restaurant. 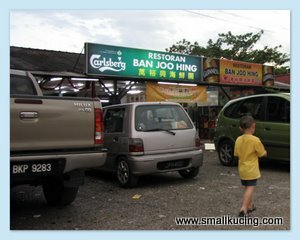 It's called Restauran Ban Koo Hing. Hmm...not many people here. Is it a sign? Well, let's try it. Surprised surprised...after we ordered our food, a lady came and sell Fish Balls and all sort of sea products. 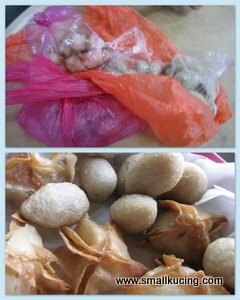 Mamarazzi bought some fish balls, fish cakes and fish wantan. Taste delicious! Looks like I have a secret admirer back there. First dish came. 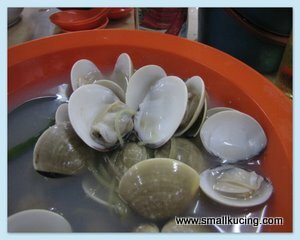 Seong Thong Lala(Clam Soup) RM12. 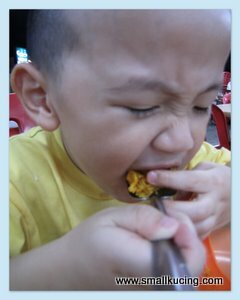 Alamak...Papa told them don't put Cili Padi. They forgot and put. Spicy but the Lala(clams) were very fresh and juicy. 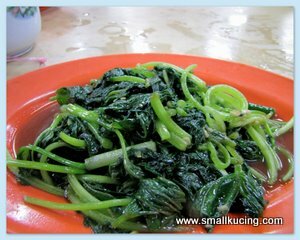 Stir-fried Sweet Potatoes Leaves RM7. Taste okay. 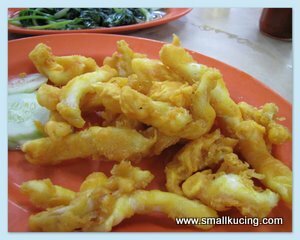 Fried Squid RM15. Papa said it's chewy. Hmm...no ah...nice. Just nice. In fact, I managed to finish almost the whole plate of this with Mamarazzi's help. Crab Fried Bihun. Bet someone in New Zealand would be drooling. RM50. The Crab taste delicious! Mamarazzi said the bihun was a bit oily for her, But both Papa and me feels it tasted okay. Papa liked the Clams so much that we ordered another plate of it. 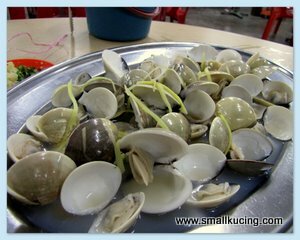 This round we had Steamed Clams. Also taste very good. The soup tasted even better without the Cili Padi. Yay! Found another good place to eat. Hmmm ...weird.... coz Mamarazzi noticed that the two tables seated near us were locals. Could this restaurant be the food hunt for the locals in Tanjung Sepat? 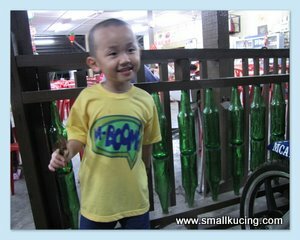 Have we inadvertently came across the secret shop of Tanjung Sepat? Go there? Good idea... but auntie dowan to go there. Auntie wanna live by the beach. Very tired of living in the city liao. Too complicated. Love the secret admirer picture - too cute! 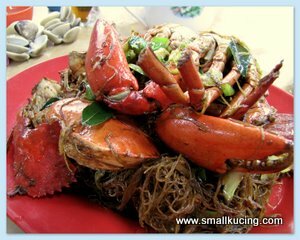 crab beehoon! yummeh. been looking for good ones.! 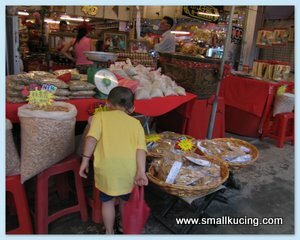 Those salted fish looks like a must have.. Won't mind having some.. My husband is a great fan of sea food. 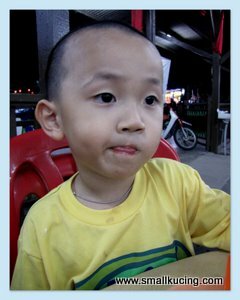 Seeing your photos make me wanna go there for a meal..
Did you try the famous mui chai pau, not bad wor! The locals normally eat at restaurants that are not so busy...lol! Mana mana pun sama aje. you sure only the crabs? The lala is getting to me Kathy, tak boleh tahan after looking at the pics.